On the occasion of 52nd Dai Syedna Mohammed Burhanuddin RA second Urus Mubarak – Tabarrukaatu Ayyamil Urs, Syedna Khuzaima Qutbuddin TUS presided over Khatmul Quran Majlis on the eve of the 14th and 15th of Rabiul Awwal in the Poconos, USA. On eve of Urus Mubarak, 16mi raat, Syedna TUS presided over Urus Mubarak Majlis and Darees. After Sadaqallah, Qasida Mubaraka written by Syedna Qutbuddin TUS in remembrance of Syedna Mohammed Burhanuddin RA was recited. Bayaan recording of Syedna Burhanuddin RA bayaan was then played. May Allah Ta’ala elevate Syedna Burhanuddin RA in the highest echelons of Jannat in A’la ‘iliyyeen. 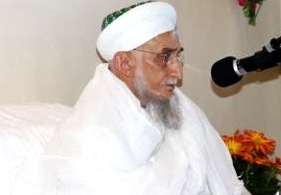 May Syedna Burhanuddin’s nazaraat continue upon us, the followers of his successor, Syedna Khuzaima Qutbuddin TUS. May we receive the ne’mat of Syedna Burhanuddin’s RA ziarat in Rozat Tahera with his Mansoos.